Welcome to The A.V. Club’s Unbreakable Kimmy Schmidt binge-watch. From Friday, April 15 through Sunday, April 17, Gwen Ihnat will be watching and reviewing every episode of the Netflix sitcom’s second season. You can watch and comment along with her here, or chime in on the individual episode reviews. For those watching the show at a more moderate pace, daily reviews by Kayla Kumari Upadhyaya will start running Monday, April 18. Perhaps to prevent any hint of a sophomore slump, Tina Fey herself took the season-two premiere in hand for Unbreakable Kimmy Schmidt, leading to a breathless episode that nicely sets up the next 12. With a flash-forward to Christmas, we get to see that Titus will get a relationship. Mimi (Amy Sedaris) will make a welcome return. Drunken Sonia will come after Kimmy due to the Dong situation, and there’s something about a painting and Jews for Jacqueline. Her polished appearance means that she gets away from the southwestern roots of her family, which her parents seem as relieved about as she is (although you can only imagine how pleased the Corn God would be with a rendition of the “Electric Slide”). Jane Krakowski’s physical comedy of Jacqueline without her contact lenses, however, will be missed. 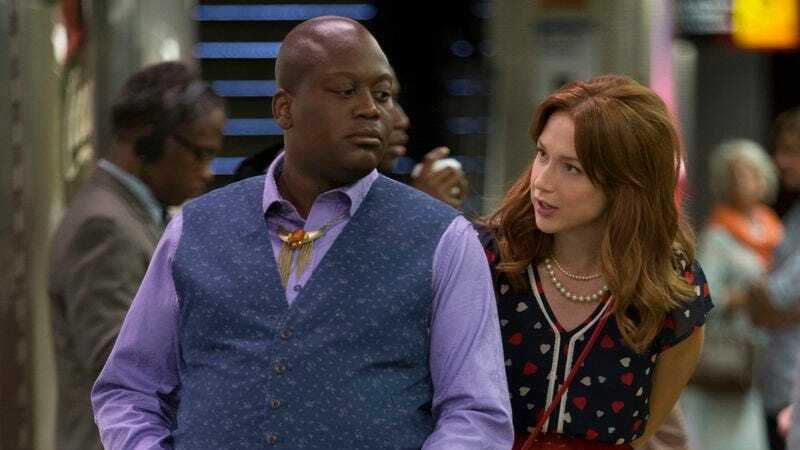 After Richard Wayne Gary Wayne was finally dragged off to prison, season one of Kimmy Schmidt left us on a cliffhanger involving not one but two marriages: Titus’ wife from his Mississippi past, and Dong’s green-card wedding to senior-citizen Sonia from class. Both of these are tackled head-on in this first episode, with varying degrees of resolution. Titus needs to remember the Ronald that he was, and friend to Vonda. Dong is stuck with Sonia for two years, but he wants to be an American citizen more than anything else—so that’s the price he’ll have to pay, even though it means giving up Kimmy. The not-so-underlying message is that you can’t deny who you really are. Jacqueline is ridiculous in the corn fields, as she was clearly meant for Manhattan high-society cocktail parties. Kimmy may try to be down with a New York where everyone is “moral relatives,” but she still struggles with kissing a married man, even though his marriage is fake. And Titus, as we see, has any number of people living inside him, but the most important one is Ronald, a nice guy and former good friend to Vonda, even though he had to abandon her to find himself in New York City. From Titus’ first (in denial) perspective, he saw himself not as an abandoner, but a brave runagay who breaks out on his own. In his mind, he’s the hero of his own movie. The best part is that we’re all heroes in our own movies. Although none of us are as heroic as Kimmy, who makes spearing an elf head on top of a Christmas tree festive, and can dispense with prior troubles with a simple “‘Later gator!’ to the problems of yesteryear.” As we embark on this second season binge-watch, I would love to find out just where Kimmy’s unbridled enthusiasm comes from. Can someone really just be born like that, or is this a defense mechanism she had to develop in the bunker? Most importantly, how can I siphon off some of Kimmy’s incessant optimism? Even when she’s thwarted—here losing her job, boyfriend, and favorite scrunchie—she’s a good enough friend to find solace in Titus and Vonda’s make-up dance. And even though Dong isn’t on that train platform, she knows that at least that Amtrak is running two hours late to make sure that everyone else gets the resolution they so sorely need. Dong mimicking the Kardashians = the best. Kimmy doesn’t get it: Thinking that an animal rights 5K was so that animals could marry each other. Kimmy cartoon-character-worthy outfit: The red and blue heart print dress, matching floral purse, super-cute strappy red sandals, and blue scrunchie was a symphony of color coordination.